The general sequence of events will included 4-wheeling adventures Monday, Wednesday and Friday. Tuesday provided each Syncronaut the opportunity to plan their own adventure, rest or repair their Syncro. Thursday afternoon 13 Syncronauts went on a two-hour Colorado River boat tour and others created their own recreation plan. Below is a general outline with overview information about the 4x4 routes planned. BLM 378) from US 191 east toward Arches National Park. Along the way we saw various sights and encounter driving in a wash and over some rocky portions and a stop to see some dinosaur tracks. 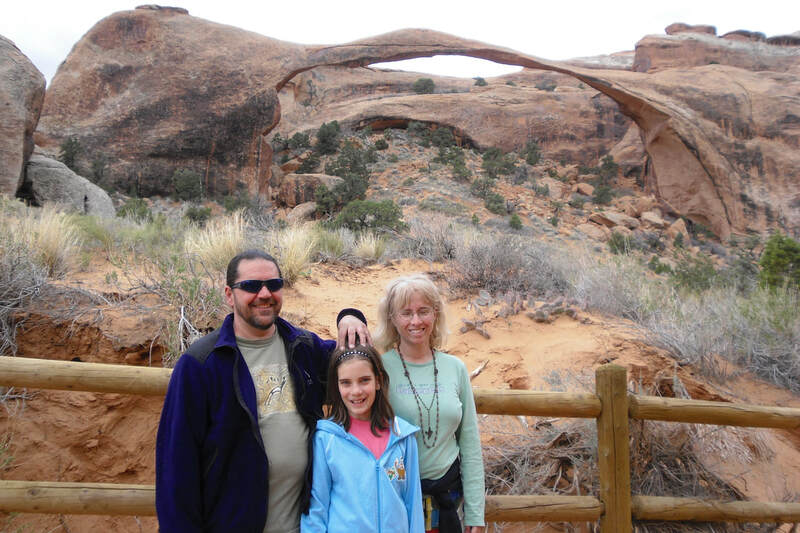 After entering Arches National Park, we visited Eye of the Whale Arch and then had lunch and took optional hike to Delicate Arch. 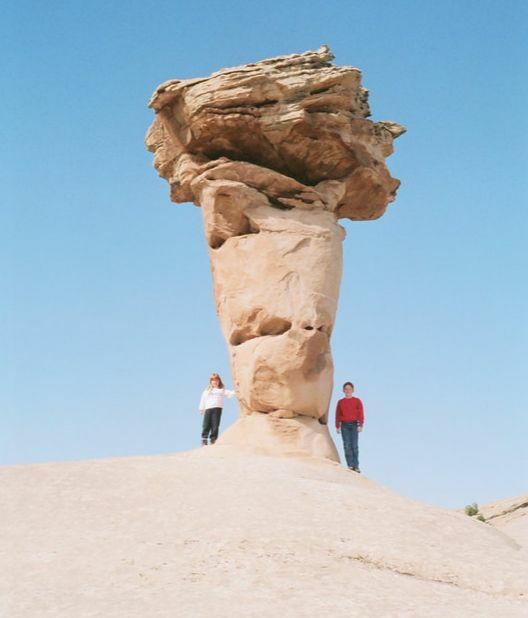 Then we headed further north to take an easy walk to see Landscape Arch and then doubled-back to see a few more sights before heading back to Camp Syncro. ​A day for hiking, biking, rest, relaxation or whatever suits you. In the evening we had our legendary Taco Night. After dinner we were treated with a presentation from guest speaker Sara Sidwell from the Museum of Moab. 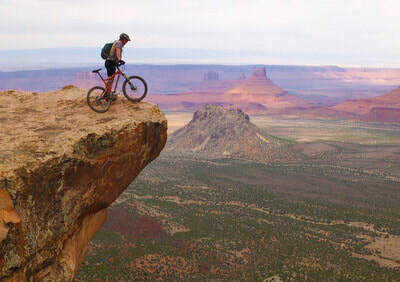 The topic was the history and development of the roads and trails in the Moab area. 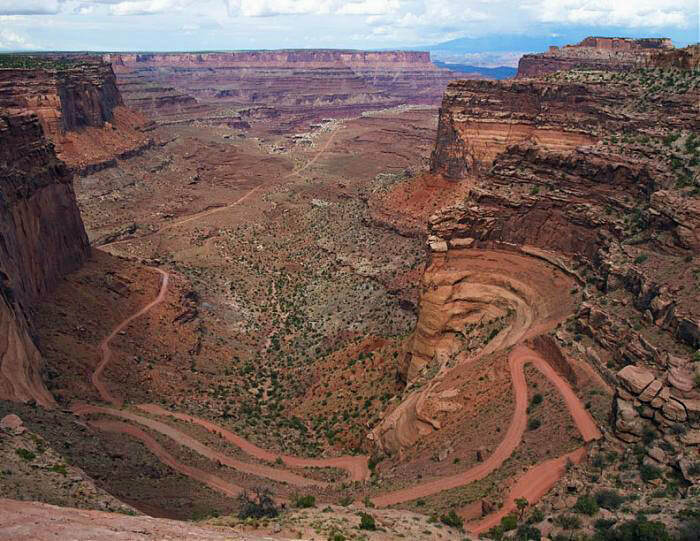 Potash Road - Shafer Switchbacks - Dead Horse Point - Gemini Bridges. A spectacular loop featuring some of the best sights in the region. We started by travelling west along the Colorado River and take Potash Road to Shafer Canyon Road and up the Shafer Switchbacks. From there we headed north, east and south to the spectacular viewpoint at Dead Horse Point to overlook the trail we'd taken earlier in the canyon below. After lunch there, it was north again to experience Gemini Bridges and the trail back toward the highway north of Moab. 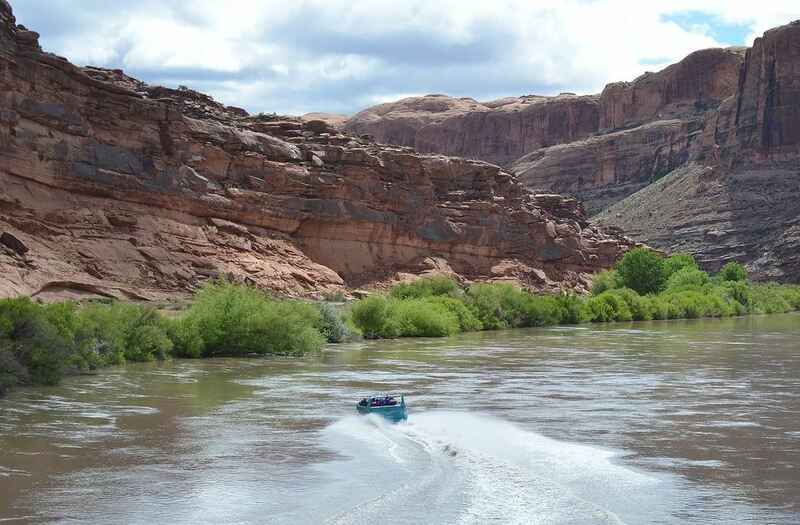 Take an optional jet boat tour on the Colorado River with Moab Jett. Two-hour boat tour with Moab Jett. Terrific! Another amazing loop trim combining several cool places to visit. 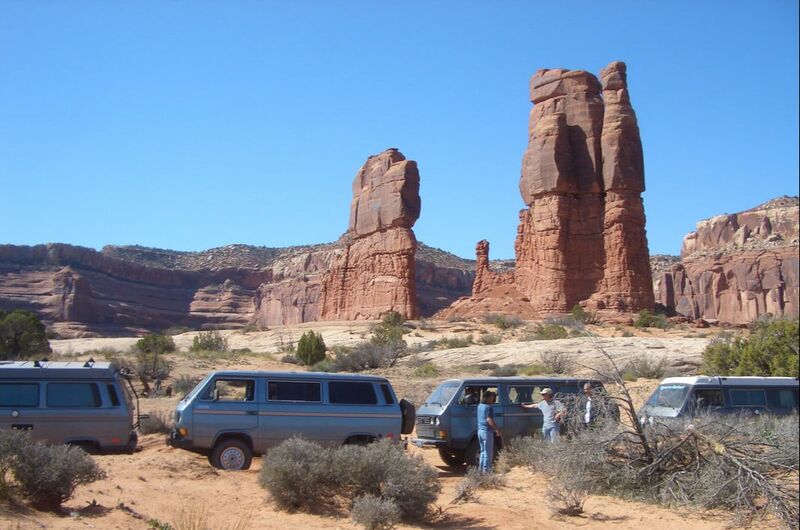 We started north of Moab and visited the well-preserved dinosaur tracks near Mill Canyon and then around Courthouse Rock on stretches of slickrock and loop back past Determination Towers. Travelling northwest we visited Tusher Tunnel for a short hike there and then on to Secret Spire. 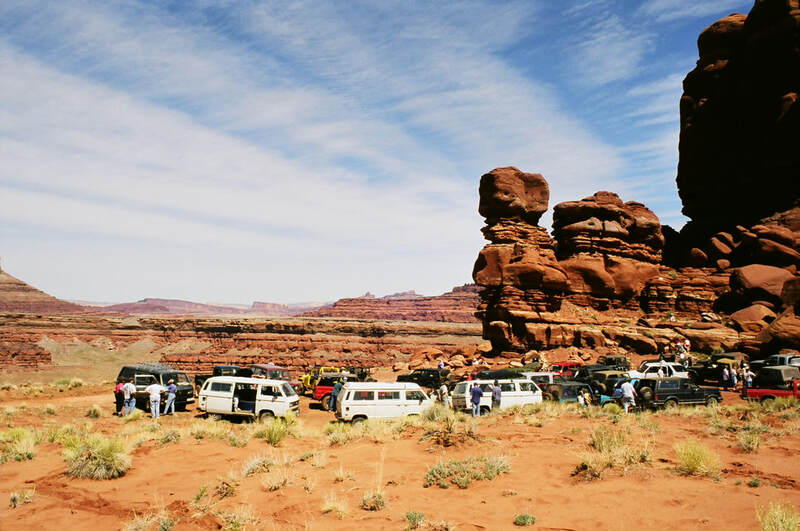 Secret Spire is one of the places we visited during Syncro Safari - Moab '98, so it's a bit of nostalgia to revisit the spot on the 20th Anniversary of Syncro Safari. After Secret Spire, we got to go down through the spectacular Long Canyon back to the highway.